The main street of downtown Nogales, Ariz., ends abruptly in a steel wall towering 20 feet above the colorful junk shops cluttering Morley Avenue. Historically, Nogales straddled the international border. Today, the town is bisected by one of the most militarized borders in the world. I bought a strawberry Popsicle from a vendor on the Mexican side, passing a dollar bill through a gap between the thick vertical columns. As far as I could see in either direction, the wall stretched up and over dry hills. A white U.S. Border Patrol truck was perched on a hill above us. It was quiet now, but the first time I’d stood in this spot several years ago, I’d watched a pair of men hurriedly toss their small backpacks over, help each other climb across the top, and almost immediately be chased down and arrested on the U.S. side by a waiting Border Patrol unit. About one-third of the 2,000-mile border line between the U.S. and Mexico is actually fenced like Nogales. For the remainder, the Department of Homeland Security relies on patrolling natural geographic barriers, such as the Rio Grande, mountain ranges and the 100,000-square-mile Sonoran desert, in order to deter migrant crossing attempts. Rhetoric around building a wall is a convenient way to avoid the need to engage in complicated discussions of comprehensive immigration reforms or addressing the root causes of forced migration. We understand the stark “us” vs. “them” that a militarized border emphasizes. We probably don’t understand as well how U.S.-led trade agreements undermined rural economies, the desperation to reunify families split by deportation, or the very real threats of death and violence by cartels against innocents in Mexico and Central America. Over a dinner of chicken and tortillas, I listened to a Honduran woman, traveling with her 9-year-old daughter, tearfully describe their journey so far. We were sitting at a long table in El Comedor, a migrant aid station run by Jesuits called the Kino Border Initiative, or KBI, a binational, migrant advocacy organization. The violence in Honduras became too much. The mother-daughter pair had been traveling for a month and a half, often on the top of freight trains called “el tren de los muertes” or “the death train,” and had endured assaults that made her question if she’d made the right decision to pursue asylum in the U.S. The following morning, the two would leave a crowded staging house with a coyote, or hired human smuggler, to begin the journey on foot across the desert. “Your mother is the strongest woman in the world,” I told Rosalba, her daughter. Rosalba was more interested in the box of crayons she’d just received. She wanted to be a women’s doctor in the United States and was excited to learn English and to have American friends. As I write this, she is probably walking through some inhospitable stretch of the Sonoran desert with the crayons, along with everything else she owns, in her tiny backpack. Between 1998 and 2015, nearly 6,500 migrant deaths have been confirmed along the U.S.-Mexico border, with the highest numbers of deaths consistently reported in the Tucson sector (U.S. Border Patrol). The official strategy of “Prevention Through Deterrence” rather than stopping migration flows has pushed people who are desperate to cross through more and more remote, deadly stretches of the desert. “Death by Deterrence” is the critical label human rights groups have assigned to the Border Patrol policy. The Rev. Peter Neeley, a Jesuit priest, works with the Kino Border Initiative to provide basic aid and services to deported immigrants. “As long as you say it’s for national security, you can justify anything,” said the Rev. Peter Neeley, a charismatic Jesuit who has seen forced migration up close for the past 30 years working between war-torn El Salvador and the Kino Border Initiative. “Otherwise, you’re seen as being soft on terrorism. History repeats itself. We just change the ‘isms. 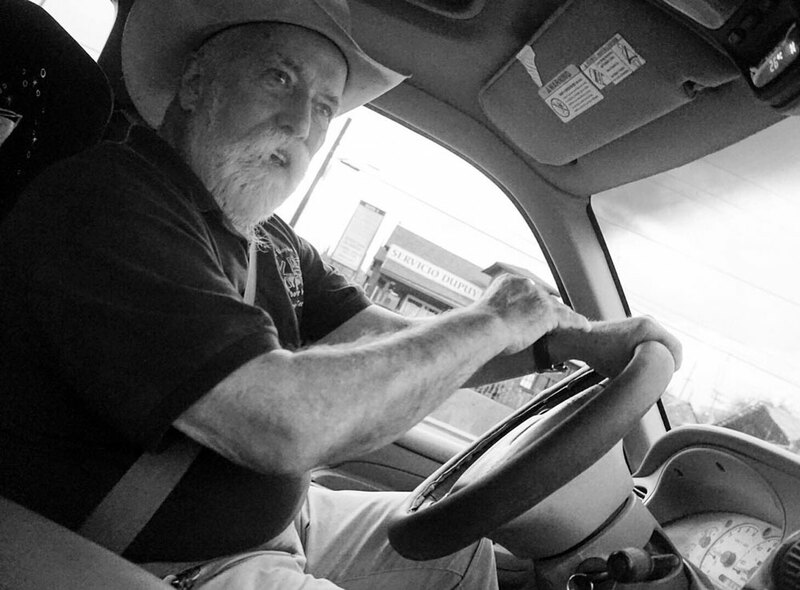 '” Neeley, a former college soccer star, wears a cowboy hat and a big white beard. He’s quick to laugh, quick to curse, and obviously a well-known and respected figure here. My tour started with tagging along in his truck to run a few errands near KBI’s Nogales office before passing unchecked into Mexico. El Comedor serves meals and provides first aid and basic services every day to dozens of recently deported immigrants and people arriving from Central America. The aid center is just a few blocks away from where a rusted iron cattle chute deposits “repatriated” migrants through a one-way turnstile into a Mexican neighborhood dominated by predatory cartel activity. We were standing on the dusty sidewalk in front of El Comedor after supervising Rosalba, her mother and several other people who had just finished dinner, walk the dangerous dozen or so yards between the center and a waiting bus. Kidnapping “sequestro" of vulnerable migrants for ransom in this area is common. It’s just one of the many dangers faced on the journey toward the dream of working a low-wage job in the U.S.
Colleen Sinsky is a former retention worker at JOIN, and is currently working along the U.S. border with Mexico helping provide relief to immigrants. Earlier this year she served on the Greek island of Lesvos to help Syrian refugees. Colleen Sinsky is a former retention worker at JOIN and is working along the U.S. border with Mexico helping provide relief to immigrants. Earlier this year, she served on the Greek island of Lesvos to help Syrian refugees.